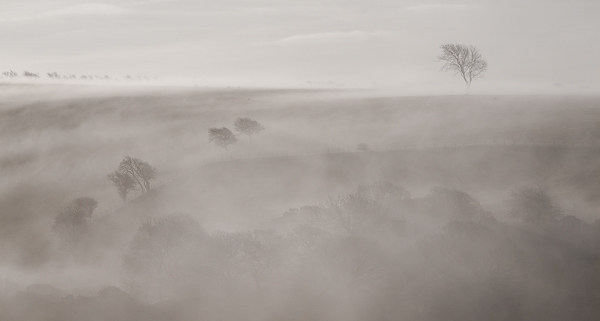 Winter morning near Aberystwyth – cruelly overlooked by this years LPOTY judges. Image manipulation has been uppermost in my mind recently. Earlier this year I entered the Landscape Photographer of the Year competition, none of my images getting past the first stage. I was disappointed but soon forgot all about it. Then ten days ago I discovered that the competition was mired in controversy. Three winning images by one photographer had been disqualified following analysis by independent observers which showed them to have been composites. In other words what appeared to be a single image was actually a combination of two or more others. Tim Parkin, the guiding light behind OnLandscape online magazine, had shown that the landscape in the winning image must have contained two suns if it had been for real – one at one angle to create strong shadows, and a second to form “god-beams” at another. Quite shockingly the judges had not originally noticed this – nor could they have seen the relevant RAW file. I don’t have a problem at all with the principles underlying the first three categories but the definition of Your View seems flawed. How much manipulation is too much here? And why should “originality” and “conceptual thinking” need or involve it anyway? In my opinion there is a gulf – a yawning chasm, almost – between what has traditionally been understood as image “processing” (or “adjusting” in LPOTY parlance) and what is now achievable in Photoshop. The original competition winner was clearly working on one side of the chasm, while the rules stated that he should have been on the other side. It must be difficult for younger photographers to understand this because they have developed their skills entirely within the Photoshop era. Photography has, until very recently, always had (with a few exceptions) an umbilical link with reality. I am surprised that some photographers cannot see that this link is broken when one image is put together from selections of two or more others. I do not deny that there are grey areas where arguments may occur. But that does not deflect me from my identification of a quantum difference between processing and manipulation. Those who claim that “It’s all manipulation” are just plain wrong. Perhaps the current controversy will result in the LPOTY organisers making it more clear that manipulated images (such as composites) are not acceptable in the competition as it stands. They would need to define exactly where processing ends and manipulation begins, but this should not be a problem. In my imagination “Your View” suggests a personal interpretation of a landscape, or a personal relationship with the land, which would not be appropriate in the other three categories. So for those whose skills lie primarily at the keyboard end of the photographic process a separate category should be introduced. To add an analogy it would be a bit like banning smokers from inside the pub but providing them with an area outside where they could indulge. Photoshoppery is a valid technique for many purposes, and the resulting images can be stunning. But without documentary values are they really photographs at all? A separate category for manipulated images would do all (landscape) photographers a service. They would be able to decide which side of the line their images stood, and – in an era when sometimes anything seems to go – it would help to define what exactly a photograph is.